We’ve joined the sourdough revolution. 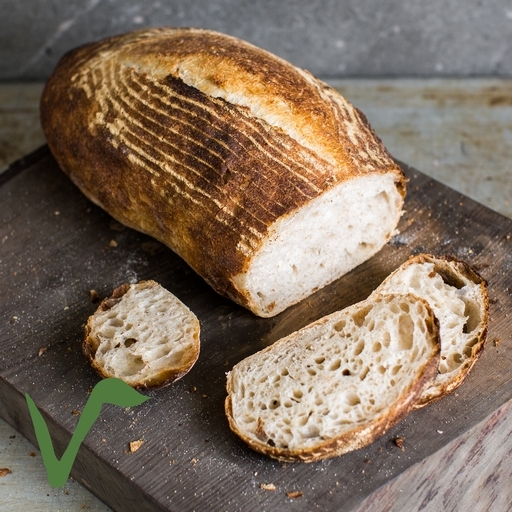 Our loaf is handmade using just organic flour, water, salt and a natural yeast leaven. It takes 48 hours to prepare and bake each loaf, but it’s worth it get the sourdough just how we like it: crumpet-like in texture, complexly flavoured, and finished off with a deeply coloured, pleasingly chewy crust. While the bread tastes great on delivery to your door, to make it even better place in a warm oven for 5-10 mins before eating. It will restore crunch to the crust – as if fresh from the baker’s oven.